Justify or Align? In this guide we’ll cover common alignment options in typography and how to use them for the best results. Alignments in typesetting are dependent on two main things: layout and readability. For readable copy, let’s say multiple paragraphs, there a few well established rules to follow if you want people to get your message. Let’s look at some of the options and the scenarios that guide their usage. Align vs Justify – What’s the Difference? Aligning text makes each line of continuous text return to one side of the margin. Justifying text forces the spaces between words or individual letters to expand or contract to fill the margins edge-to-edge. Looking at these terms, it’s easy to see why people will often interchange them, but they are not technically the same. They also lead to colloquialisms like “force-justified,” which is redundant. So, when we align the text to the left, we call it Left-Aligned. For the Center, Center-Aligned. What about the right side? That’s right, we call that Right-Aligned. In Adobe InDesign, known for its publication layout power, find these options in the Paragraph window. Window > Type & Tables > Paragraph, or Command + Option + T. With the text selected you can change your alignment or justification here. Left Align – Use for most copy. In western languages, we read from left to right, so having that constant left edge helps us scan and comprehend sentences quickly and efficiently. Center Align – Use for headlines and subheads, such as supporting copy that is a paragraph or shorter in length. Right Align – Use for headlines with just a few words. Right-aligning longer lengths of text can be fatiguing, so use it sparingly on anything more than a complete sentence. Justified type was common to newspapers in the past – an artifact from when copy was physically set with blocks of letters. Using Justified text today is a subjective choice. There are certain design and aesthetic uses, but it can impact readability in more copy-heavy instances due to the uneven spacing and broken visual rhythm of the words. You’ll still see large blocks of justified text in certain magazines and books (and of course newspapers). Notice how the negative space forms Rivers (when your eyes connect the spaces into paths that distract from the information) and scattered gaps because the text is forced to fill the margins. Rivers are distracting and unnecessary. That’s why it’s best to use Left Align for paragraphs of text. Align and justify are just the basics of text layout. Here are a few more text and layout concepts that you might hear or read about. Rag – Describes text that is aligned on one side. “Rag right” refers to text that is Aligned Left, and not Justified. This was a handy term in early advertising when justified text – newspaper style – was still common. It’s good design practice to manipulate the shapes made by ragged type. Soft returns can be used to prevent edges from distracting the flow and appearance of a paragraph. Don’t know what a soft return is? Keep reading. Hard return – When the typesetter hits the Enter/Return key, this starts a new paragraph. Use this to create a break in style or activate certain settings based on style, like a pre-set space after a paragraph, or leading settings. Soft return -When the typesetter holds the Shift key then hits the Enter/Return key, this forces a line break but stays within the paragraph, keeping leading and style rules intact. Widows – In continuous text covering multiple pages or columns, a Widow is a word or sentence that has carried over from the previous page or column. Orphans – Same as above but opposite. An orphan is a line of text that starts at the bottom of a page or column, with the rest of the paragraph finishing on the next page/column. Widows and orphans are also used to describe single words or fragments whenever they are separated from their paragraph or sentence. Generally speaking, an orphan is at the beginning and a widow is at the end. Hyphenate – In InDesign, turn Hyphenate on or off by checking the box on the bottom left corner of the Paragraph window. You can also change settings for hyphenation. I usually just keep it off, but for larger amounts of text they can be handy. In that case I set them to occur rarely, to improve the look of the copy. If I need to, I can hyphenate manually or back off the settings. Hyphenation settings are in the Paragraph window. Click the hamburger menu in the top right corner, and choose Hyphenation… from the list. Save time and money with Shutterstock Bundles, our curated image packs. 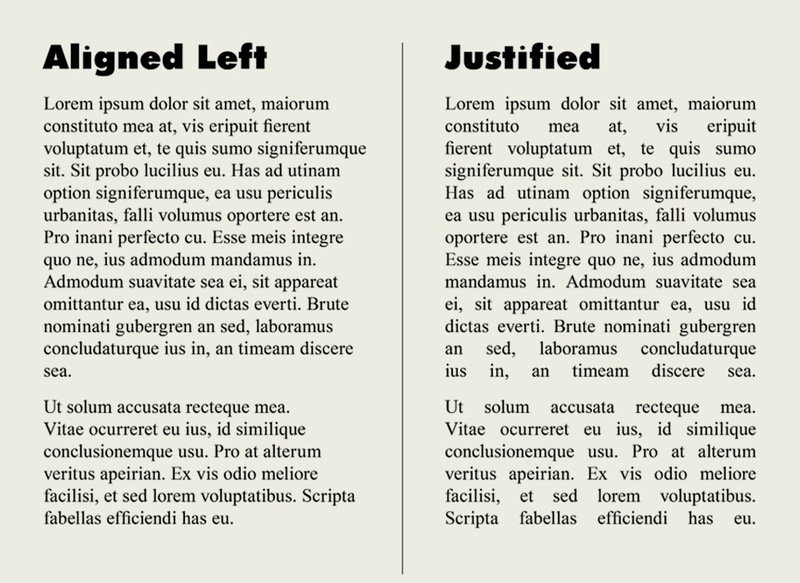 The post Justify vs Align: Getting Started with Type Layout in InDesign appeared first on The Shutterstock Blog.